A Firewall is a device, usually a router or a computer, installed between the internal network of an organization and the rest of the Internet. It is used to control the access of the Internet. It is designed to forward some packets and filter others. It can be used to deny access to a specific host or a specific service in the organization. It is a network security system. It is used to monitor and control over all incoming and outgoing network traffic of your system. It is based on advanced and a defined set of security rules. Firewall is a software program that can be considered as a security tool for your PC. We use it to enhance the security of computers connected to a network, such as LAN or the Internet. Firewalls separate your device from the Internet using a “wall of code”. It verifies each individual “data packet” arrives at either side of the firewall. After that it decides whether to pass it or not. Firewalls can further enhance security by enabling granular control over what types of system functions and processes have access to networking resources. These firewalls can use various types of signatures and host conditions to allow or deny traffic. Network firewalls filter traffic between two or more networks and run on network hardware. 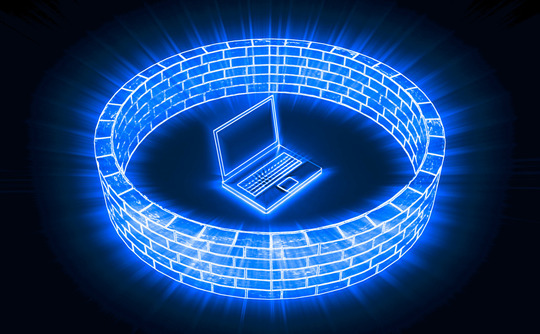 Network firewalls guard an internal computer network against malicious access from the outside, such as malware-infested websites or vulnerable open network ports. We can configure it to limit access to the outside from internal users. For example, in the case of parental controls or workplace locks, both of which commonly prevent access to gambling and adult websites, among many other content types. Host-based firewalls run on host computers and control network traffic in and out of those machines. It is usually classified as Packet-filter Firewall & Proxy firewall on the basis of its working. A packet-filter firewall is a router that uses a filtering table to decide which packets must be discarded i.e. not forwarded. A firewall can be used as a packet filter. It can forward or block packets based on the information in the headers: source and destination IP addresses, source and destination port addresses, type of protocol (TCP or UDP). A packet-filter firewall filter at network or transport layer. 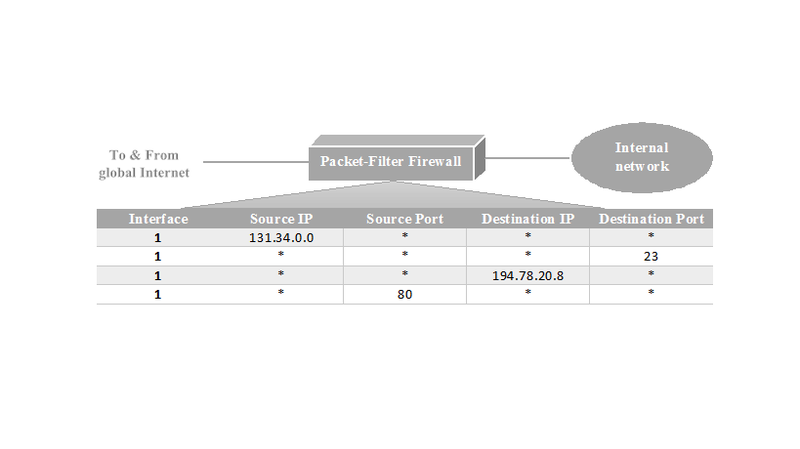 An example of a filtration table for such firewall can be shown below. Security precaution: incoming packets from network “131.34.0.0”. Here “*” means any. Incoming packets destined for any internal TELNET Server (port 23) are blocked. Incoming packets destined for internal host “194.78.20.8” are blocked. The organization wants this host for internal use only. Outgoing packets destined for an HTTP server (port 80) are blocked. The organization does not want employees to browse the internet. The packet-filter firewall is based on the information available in the network layer and transport layer headers (IP and TCP/UDP). Sometimes we need to filter a message based on the information available in the message itself at the application layer. Installing a proxy computer between the customer computer and corporation computer can be a solution to this situation as shown in the figure below. 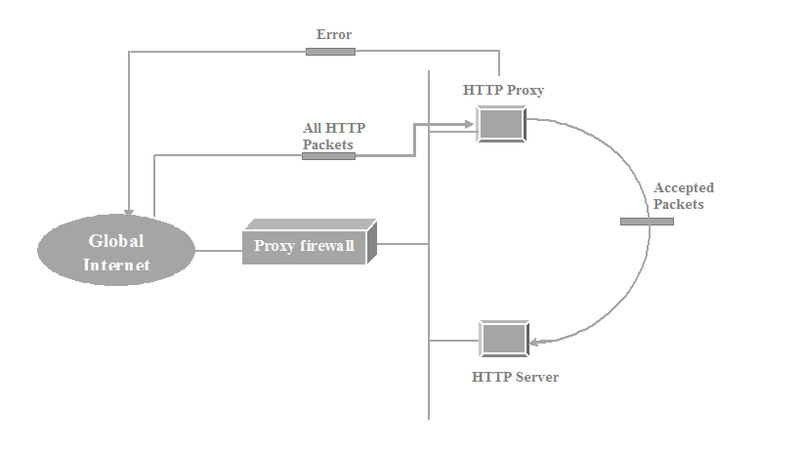 When the user client process sends a message, the proxy firewall runs a server process to receive the request. The server opens the packet at the application level and finds out if the request is legitimate. If it is, the server acts as a client process and sends the message to the real server in the corporation. If it is not, the message is dropped and an error message is sent to the external user. In this way, the requests of the external users are filtered based on the contents at the application layer. A proxy firewall filters at the application layer. Firewall can constantly monitor all incoming and outgoing traffic. Firewall is different from just a traffic analyser because we can also use set up to block certain things. A firewall might disable particular applications from accessing the network, block URLs from loading, and prevent traffic through certain network ports. Some firewalls can even be used in a mode where they block everything until you explicitly allow every single access. This is one way to block everything on a network so that you can manually set up safeguards against network-related threats. In this era of high-speed Internet Access, our systems are electronically connected to a broad network. We have limited control and limited protection here unless we don’t install our personal firewalls. High-speed internet connection is attractive. It has its own drawbacks. The feature that makes a high-speed connection attractive is also the reason that makes it vulnerable. It is like leaving the front door of your house open and unlocked. It is because of a constant IP, always active connection and of course the high speed access. So, you must know how you can defend yourself against the threat posed by this type of connection. PERSONAL FIREWALLS can make your computer safe from such dangers. Was this page helpful? Must share your views in the comment section below. Keep visiting Tech-Blog and get updated with our latest technology blogs.